Access practical nutrition advice related to diabetes, liver, heart or kidney conditions. Manage digestive issues, celiac disease and food allergies. Receive support during and after pregnancy. Learn about healthy eating and nutrition for all ages. Led by our team of registered dietitians, free Ask a Dietitian group appointments give you healthy eating tips in a group setting. Diabetes or pre-diabetes: for patients with impaired fasting glucose, impaired glucose tolerance, Type 2 diabetes, diabetes, high blood sugars or borderline diabetes. Weight management: for patients who are overweight or looking to lose weight. High blood pressure or cholesterol: for patients with high blood pressure or cholesterol, dyslipidemia, hypertension, high triglycerides, a history of heart attack/stroke/myocardial infarction (MI) or hyperlipidemia. Find out more about Ask a Dietitian. Patients can also request one-on-one appointments with a dietitian to discuss their health concerns. Ask your doctor if a referral to a dietitian is right for you, or book a one-on-one appointment through our program coordinator at 1-855-79-CFPCN (23726). 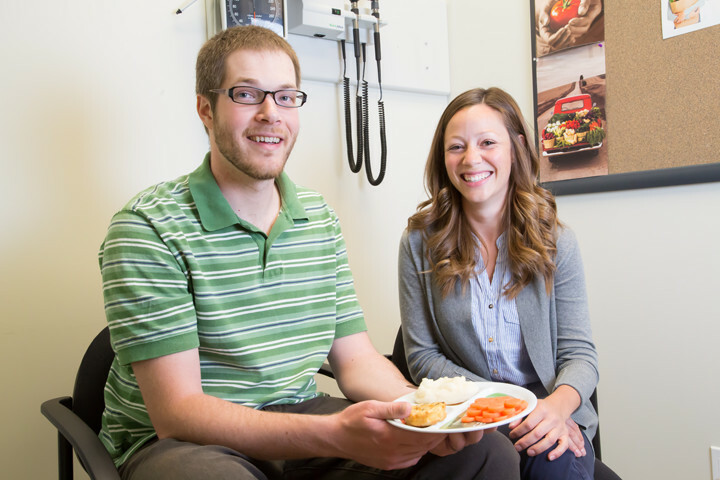 Read patient John-David Malta’s story about his appointment with our registered dietitian. Find healthy recipes and nutrition advice from our registered dietitians on our blog.